* WARNING – if you are a vegetarian, you may want to skip this post. 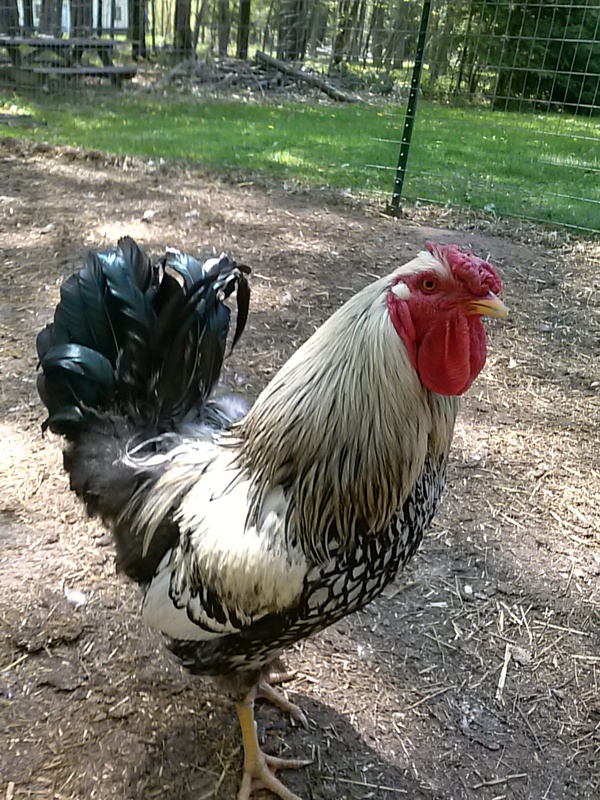 My beautiful rooster got to be a problem – he would not leave my hens alone, he was constantly mounting them. Every one of them has a bare back right now – my white hens still have most of their feathers on their backs, but they always had dirty backs from his feet, and they were losing feathers on their heads. At first I hoped they were molting, but I eventually realized this was not the case, based on where they were losing feathers. I didn’t want to just separate the rooster from the hens, because I didn’t have a separate place to put him. I also know that several of my older chicks are roosters as well, so I will have to figure out who gets to stay/who has to go at some point anyway. This weekend, after spotting more bald spots on a particular hen’s head, I decided it was time for him to go. 1. Always read up on how to do things beforehand. Don’t just rely on stories people tell you, “well, Grandma used to do this…” I did not do research beforehand. I just went ahead and gave it a try. I was not sure how to make certain cuts when butchering. I also didn’t realize how hard some of those feathers would be to get out. I didn’t end up scalding him, so the wing feathers and pin feathers were extremely hard to pluck. I ended up cutting the wings off because I didn’t know what to do to get those feathers out. 2. Always let the meat rest in the fridge for a day before cooking or freezing. In the middle of roasting, I decided I should look up online how to butcher a chicken properly, for next time. That is where I learned that if you try to cook it right away, rigor mortis sets in and you will end up with a very chewy bird. We ended up with a very chewy bird. A day’s rest will let the rigor pass and the meat get soft again. 3. Do not overcook. I roasted it at too high of a temperature, and cooked for too long. This, along with the rigor, made our chicken very hard to chew at first. I do know how to cook a chicken, but I usually underestimate how long it will take when meal planning, and have to add time on, and we end up eating the side dishes while the meat is still cooking because it’s taking too long. So I went overboard on the cooking, and it showed. 4. Always have someone around that is an adult. My six year old son was there, and he didn’t like the rooster so he was happy to watch – the rooster was a little threatening to him most of the time. Daniel attempted to help me pluck feathers, for a minute, and then went back to playing. Then the neighbor kids showed up, while I was in the middle of plucking and butchering, and Daniel wanted them to all go inside. Our dogs are not the friendliest (well, Atat is, but Downey is not usually) and I yelled at Daniel to make sure they all stayed outside since I was arm deep in trying to butcher a chicken without really knowing what I was doing, and had no time to try to get the dogs out of the way. My husband was at work; I should have waited for him to get home before attempting all this on my own. 5. Always have all your stuff (knives, bags, towels, etc) ready beforehand. Nothing is worse than needing to make a cut in your chicken, and you somehow got dirt on your knife, and need to run to get a clean one, but don’t want to leave the chicken outside where the flies are already waiting to dig in. Also, always make sure your kitchen is clean so that you don’t have to attempt to butcher the chicken outside. I muddled through, and did ok. The meat tasted really good, although I did have to put it in the crockpot on low the next day so that it was a lot more tender and we could actually eat it. I also realized why dark meat is called “dark meat” and white meat is called “white meat” – it was more pronounced on this bird than on regular store-bought chicken. I don’t know if it’s like that with all home-raised chickens, or the fact that he was almost a year old, or if it was just the breed. Silver Laced Wyandottes aren’t typically a meat bird, as far as I know. Now that I’ve done it, and done the research afterward on what I should have done the first time, I think I’m ready for when the next time comes. As I said, I know that several of my chicks are probably roosters. Of my six older chicks (the “teenagers” as my son calls them), I’m 99% sure that 5 of them are roos. I don’t know how many of the eight little chicks are roosters yet. I can’t keep them all – we’ll have to decide who to keep and who gets eaten when they are older. Next Article The new garden bed is ready!